In Brief: A young but talented mage, tapping into a well of mystical knowledge coming from a past life. Catchphrase: "This kinda makes me jelly!" 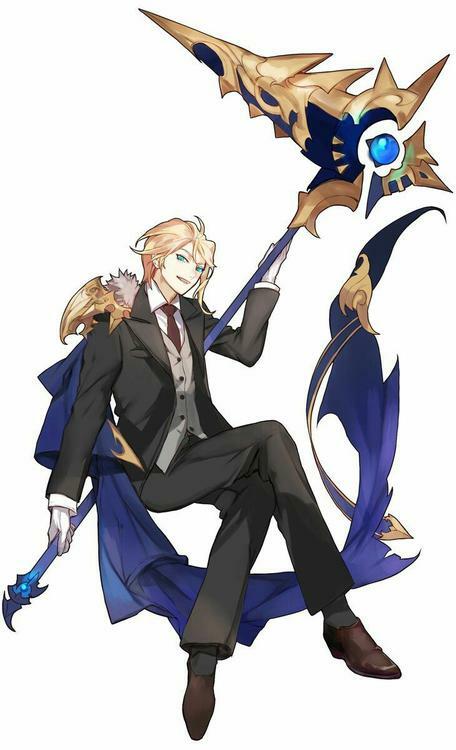 Alternate Identity: Edoardo Maria Diodato (Secret). Residence: Freedom City's Theatre District. Base of Operations: An old loft in the Theatre District (his house, basically). Affiliations: Solo, at the moment. Family: None that he knows of. Edoardo is a somewhat tall, a bit too thin and not too athletic young man. He has long limbs and fingers and a pale, graceful complexion that, together with his way of carrying himself, poorly suits his personality. Ed has golden blond hair, kept rigourously tamed and cared for, which reaches up to his chin, almost covering his left eye, the rest being sleeked back with gel. His icy eyes have a piercing gaze that makes a lot of people either frown or like him, and he generally wears a range of intense expressions that includes everything from a childish frown to a maniacal grin. He generally wears comfortable but fashionable street clothing when not in costume, preferring stuff like sneakers and sporty jeans and shirts. When costumed, he wears an azure full face mask made from his own gel magic and a serious, uptight costume consisting of a white shirt, grey suit, pants and tie, shiny shoes and a pair of white butler gloves. Edoardo's story begins about three centuries before his birth, with Dionisio, a elderly mage and alchemist who lived between Switzerland and Italy, known for his pioneering works regarding the achievement of a fluid philosopher's stone, or royal elixir, as he called it. Though it worked in theory, he found that, even spending most of his lengthened lifespan studying and perfecting the elixir, he couldn't make it into an actual philosopher's stone. The only results he got were a health potion that was just marginally better than the ones his peers were making, and a petty excuse for an alchemical catalyst that slowly turned whatever it came in contact with into more of itself: a viscous, light blue colored gelatine. Felling the natural end he staved off for almost three hundred years creeping ever closer, the decrepit mage fell into a desperate research frenzy, using every single resource he could find to obtain eterna life before it was too late. He actually succeeded, though not in a way he expected or hoped. Dissolving two similar, yet different, Atlantean and Lemurian relics (obtained after much pain and effort), he managed to give a batch of his failed experimental elixir the ability to strengthen and affix a soul to a body immersed in it... or at least that was the way it should have went. The concentration of magic from the relics, and the one from the old mage's soul, in fact, proved too strong for the gelatinous medium to handle, and a feedback response from it caused the entire vat to explode into an acidic spray of solvent, which turned the whole region where the old man's mansion stood into an alchemical wasteland, dissolving not only the bodies, but the very souls of every living being in the area and nebulizing them into tiny magical particles that swirled around the place for the generations to come. The "natural" well, formed by the explosion attracted a lot of tourists, curious people, and occult seekers for centuries, until something in that streaming vortex of atomized souls and bodies regained a spark of consciousness after exactly 333 years. The thing was not, exactly, the old mage, or the people who lived near his manor, or the animals or plants, but a pure, unadulterated spiritual egg, seeded with some of the will, power and knowledge of its component souls. That egg found a host in a young woman whose name is not currently important, who, finding herself pregnant without an apparent physical mean, panicked and gave up her child for adoption. That child would later be given to the care of an old catholic orphanage of nuns near Vatican City, where he would grow up under the watchful eyes of the nuns... and God, or so they said. The young boy was a real storm in the orphanage, carrying a wind of change and fun in the gloomy, stoic life of his fellow orphans, and felt a strong pull to the occult and the supernatural since a very young age, although he never knew the cause of this instinct until he was about sixteen years old. His sixteenth birthday meant the awakening of the deep seated well of mystic power and knowledge hidden within his soul. He could now feel and see the world under a whole new light, and felt a calling to the Arts. He started to train in secret, wary of the nuns discovering his "devilish acts" as they called all the mystic practices in the world, and soon became somewhat able to muster his newfound abilities, though still completely inexperienced. The boy, with his solar attitude, also discovered a great passion for "normal" arts, especially sculpture and photography, and aced all the art courses in the orphanage, aiming to enter a prestigious art school. When he finally got out of the institute, at eighteen years of age, he actually found that he wanted to leave all that life behind and, with only a bit of money, some courage, and the camera he got as a birthday present, he set off for Freedom City, the most "special" city in the whole world, hoping to find out more about his calling and purpose in life. After four years spent researching, practicing and trying to make a name for himself in the artistic community, he has assumed the name of "Gel Azure", fighting crime and helping people with his powers and custom made staff of power, away from the selfish goals of the unknown man who created him so long ago. Edoardo is an over energetic young man, and has a distinct lack of focus bordering on attention deficit disorder territory. He is the result of an incredible experiment that culminated in the melding of dozens of souls to form his, and this is probably at least part of the problem. The other part being the strict rules and eduction he grew up on back in his youth, while in the orphanage. He was always labeled as a problematic kid and never managed to get adopted, probably because of the nuns pulling some strings to keep him and his deviant attitude around to be kept in check. He has a slight problem with auditory hallucinations, hearing things through a distorted filter or hearing voices whispering, but he manages to mostly ignore it and live a normal life without medication... mostly. Some might call his hyperactive sensibility for visual arts a sign of either geniusnor madness, and they might not be that far off, still he has recently discovered the joys of mixing the arcane knowledge in his head with the arts he has been practicing, and has found a potent motivation in experiment with this peculiar fusion. He feels awkward and bizarre at times, sticking out from other people like a sore thumb, and he might do some crazy stuff in order to be accepted... like becoming a super hero or something. Still, he knows there is more to life than he has seen or even imagines, and wants to know more about himself and his place in this complicated universe of ours. Casting offensive gel is not the best of Ed's skills, so he generally relies on his staff for direct damage. The gel staff is capable of dishing out a huge amont of damage thanks to the years of protective spells (which render it virtually indestructible) and offensive charms layered upon it, while the gel core in it weakens the stricture of anything it strikes, rendering it softer and more... well... gelatinous. This, other than making things easir to break, makes the damage and wounds dealt pretty nasty and hard to heal without proper care, even for regenerative types. The staff is also capable of being ridden as a traditional witch broom would, carrying the user at about 500MPH pretty much silently. Finally, it can grant the wielder a degree of immunity to metabolic hazards, suffocation, and environmental hazards, so long as the user keeps it on his person. Ed is also familiar with a number of spells centering around gel, making him a force to be reckoned with in battle. He can turn ordinary matter into gel, at a rate of about 100lbs per casting, create and move about large quantities of gel, which he can manipulate and shape into pretty complex shapes as well, and finally he can snare and trap opponents into suffocating, regenerating masses of sticky, sweet gel. His most used spells by far are the purely defensive ones, allowing him to turn his body and clothes into flowing gel, becoming immune to most forms of direct physical damage, or covering his person in transoarent gel which acts a ver tough shock absorbing armor, capable of nullifying almost all impacts. It is worth noting that Ed's gel is not watery or organic, has variable color, transparency, consistency and, while not edible, has a very strong sickly sweet taste (but no smell whatsoever). It is also a permanent product of Ed's mana well, and is in fact the sole possible catalyst for his magic, limiting him in his choice of spells and element. It is of course fluid most of the time, and thus Ed's spells do not have a set shape, since they do not even use traditional symbolism, just pure soul contact and meditation. Touched (by Gel): Ed's touched, there is no way around it. He hears voices, sees thibgs there are not there and thinks in a later (or rather, skewed) way. This is of course because of the origin of his soul, and so it is stronger when not using his powers for longer periods of time, and weakest when he is casting and expending his mana. Attention Deficit: Ed, for the same above reasons, suffers from a mild form of ADHD which hinders his work and day to day life. Medication is also ineffectual, as above. Hungry for Pudding: Ed's powers, however great, do not tap into an infinite well of mana, and since his soul is attuned to a very specific element (gel) he cannot recover as fast as other mages without some appropriate measures... like eating tons of sweet jell-o or pudding. Strange it might be, having his stomach filled with a large wuantity of edible gelatinous substance at all times helps him gather way larger amounts of energy frim his surroundings, acting as a natural catalyst. Device 9 (Gelatinous Gem Staff, 45PP Container; Feats: Restricted 1 [Arcane Lore +8 or more to use], Indestructible; Flaws: Easy to Lose) [29PP] (Gel, slime, sickly sweet, odorless, inorganic, non-water based, magic). Magic Spells Array 17.5 (35PP Array; Feats: Alternate Power 3) [38PP] (magic, gel, slime, sickly sweet taste, odorless, inorganic, non-water based). Ostensibly we steer towards 'Western super hero comics,' and the genre conceits of them. My concern is that this character is on the end of an anime/manga character. Which can work, but sometimes the conflicting genre conceits can cause issues. It should be noted that we generally recommend that Fortitude, Reflex, and Will saves are around PL -2 (in this case +8). This current configuration does give this character a fairly large weakness. He is also very... limited outside of his powers, which can be a bit problematic for you the player, to help with this I recommend changing the Drain Tou to have the Flaw: Limited to Objects: Drain with Affects Objects and this flaw works only on inanimate objects with no Constitution score. This will free up some points for some wriggle room with the character. He had Defensive Roll (1 rank) and 12 ranks of protection, which means he breaks caps defensively, . (He is -2 Def and +2 Tou with Def Roll and your ranks of protection he would be -4 Def and +4 Tou) I'd recommend getting rid of Defensive roll. Discussed with player, am archiving. Did attempt to convince him to remain with character.